Geneva 2012: BMW M135i | What Car? 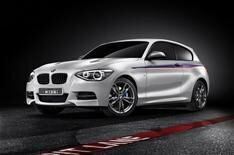 The BMW M135i a performance version of the company's 1 Series will make its debut at this week's Geneva motor show. The M135i is the first petrol model from the company's new M Performance range. It uses a twin-turbocharged, straight six-cylinder engine, which produces more than 300bhp. It is likely to appear alongside the recently announced diesel variants of the M Performance range including the M550d xdrive, X5 M50d and X6 M50d. In addition, the M135i showcases the first three-door example of BMW's 1 Series hatchback, with what BMW calls a more dynamic and elongated appearance. The car has longer doors, frameless front windows and flared wheelarches. The concept car has typical M design cues, which include large air intakes on the front apron, twin chrome-plated exhaust tailpipes and larger brake discs housed within double-spoke, 18-inch alloys. The M135i is likely to signal more petrol-powered M Performance models from BMW.